The Raspberry flavored Millennium energy bar is a great source of high quality nutrition that you can enjoy in any situation. 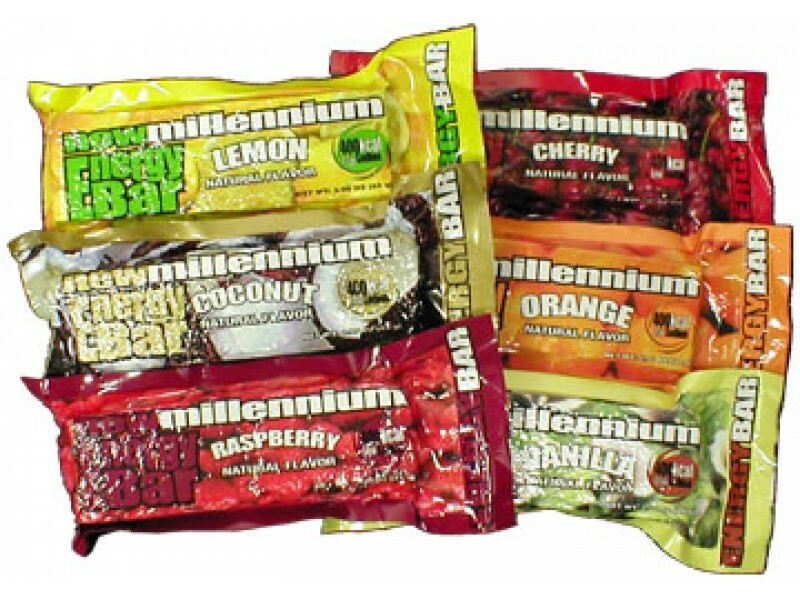 This Millennium energy bar has a great raspberry flavor that just about everyone will love. In addition to tasting great, however, it is also packed with a wide range of important nutrients. This bar is a perfect choice for taking with you on hikes, hunting trips, camping outings or just about any other situation where you don’t want to be caught without food. It is also an excellent survival food ration that will provide you with the food you need during a disaster or other emergency situation. Each bar has over 400 calories in each .25 ounce bar, which will help fill you up, and provide you with the energy you need. For those who are looking for a high quality energy bar that is packed with all the nutrients you need to keep going strong for hours, the Millennium energy bar is the ideal choice. The great raspberry flavor is extremely popular, and helps to ensure it tastes as great as it is for you. The best thing about this bar, however, is that it has just about everything you need to survive even the most difficult situations. Whether you’re on a long hike outside and need to keep your energy up, or you’re trapped in your home after a natural disaster, you can count on the quality of these excellent energy bars. Each bar has over 400 calories, 8 grams of protein, 19 grams of fat, 53 grams of carbs and a wide range of different vitamins, minerals and other nutrients. These nutrients will help keep your body strong, which is essential during physically demanding times or mentally stressful situations. 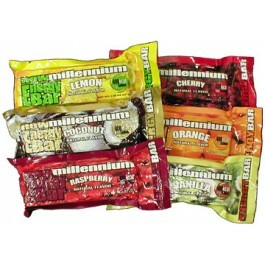 No matter what type of thing you’re preparing for, having these Millennium energy bars on hand will help ensure you can get through it much easier. NUTRITIONAL FACTS: Calories 409 kcal, Protein 8 g, Carbohydrates 53 g, Fat 19 g, Sodium 0.50 mg, Cholesterol 0. A Low Sodium Energy Bar. With 400 calories packed into each .25-ounce bar, they provide the necessary fuel to keep you going, without adding bulk to a backpack. These bars are even low in sodium to conserve your water supply. They also include a sufficient amount of carbohydrates and calories to prevent dehydration. IDEAL for Disaster and Emergency Kits Back Country Hiking, Travel, Firefighters, Police Disster Aid, Emergency Lock Downs and a favorite for school lunch packs!